Joe: What are you doing with your cellphone? Mike: I’m trying to start my car. Joe: But it is very strange for me and you look crazy by this way of starting your car. Mike: You are right, but there’s a method in my madness. As you can see from the above example, there is something strange with starting the car and Mike knows how to start it even it seems crazy but this is the way in which his car is going to start. 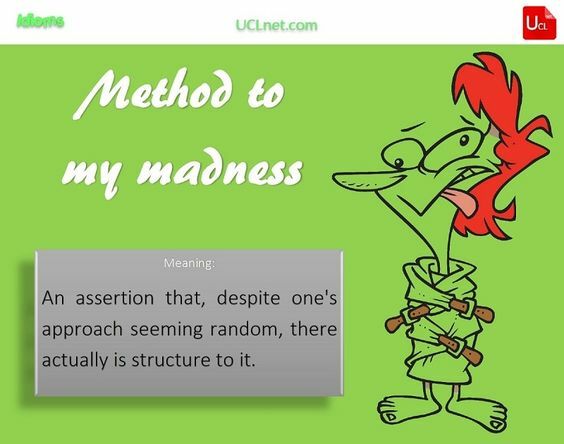 This idiom is used to say that despite one’s approach seeming random, there actually is structure to it. There is often a plan behind a person’s apparently inexplicable behavior. Based on a line from Shakespeare’s Hamlet. As you can understand from the above explanations, this idiom is related to specific, rational purpose in what one is doing or planning, even though it may appear crazy or absurd to another person. 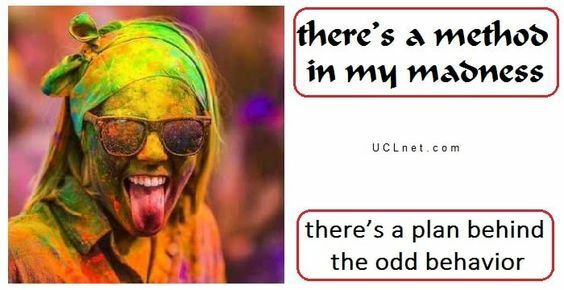 It is usually used in the phrase “have/there is (a) method to (one’s) madness. It is originated from the phrase “Though this be madness, yet there is method in’t.” in Shakespeare’s Hamlet. • There was a method to my madness when I put the ice cream in the fridge upside down. • We may think that he has gone crazy, but there’s a method to his madness. • When she’s working on her projects it seems she’s out of her mind, but when she finishes, you’ll see that there’s a method in her madness. • Even I may seem to do irrational things but taking all things into account, there’s a method to all my madness. • He used to live very disorganizedly and strange, but later we realized that there was a method in his madness. • He usually talks to himself loudly when he thinks to make a decision, but he insists there is a method in his madness. • You can’t understand my motivation for achieving success, but if you can understand me you’ll see that there is a method to my madness.